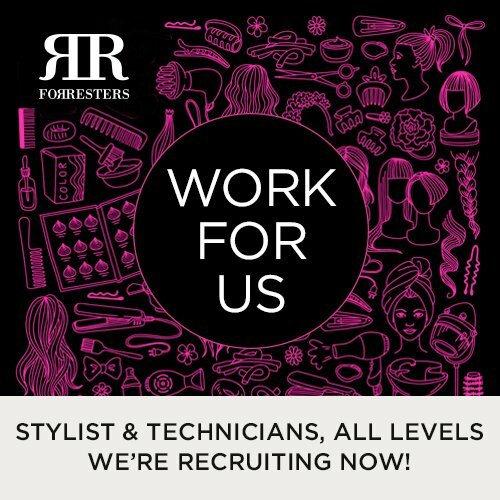 Be a part of the Forresters creative hair styling team! Thinking about furthering your career in hairdressing with an established and progressive group of salons? – Look no further. As a large group of salons, opportunities for full and part time staff arise from time to time. Forresters have an impressive track record in staff retention. Our salon teams are professional, friendly and fun and as a family business we know how to help our people to thrive. Training is at the core of everything we do so regardless of your skill level we will encourage you to work in the Forresters way. If there’s a specific job that you would like to apply for, contact us through the Enquiry Form or call the salon in question and speak to the manager. We pride ourselves on the high standard of technical ability within our hairdressing group. We run a continual assessment and training scheme for all of our salon teams and work closely with TIGI®. As part of the Forresters salon group team you will be given the opportunity to develop and improve your skill set and you’ll be working with some of the most creative and talented individuals in the industry. Train with us – we’re recruiting Apprentices now! Forresters Training Academy – Start you career in Hairdressing today. If you’re 16 years old, leaving school this year and considering a career in hairdressing, contact us today. Forresters is currently running a City & Guilds, Level 2, Hair Professional Apprenticeship at our Hairdressing Training Academy in Tilehurst, Reading. It’s a 2 year course and you will study your Apprenticeship by working in one of the eight Forresters hair salons, full time, with training one day a week at the Forresters Hairdressing Training Academy. Stuart Forrester – bem vindo de volta!